TellPoker have given me almost free hands to write whatever I like. Brave of TellPoker to let me loose in this manner, since it is impossible to know what I will write. I hardly trust myself in this area... In contrast to most blogs I am not afraid to write stuff that no one else would write. Except for gossips, rumours and scandals I will also cover advanced poker theory and psychology, like in this first article. In the following I intend to analyze a hand during the WPT Borgata Poker Classics. John "J-Dags" D´Agostino, a very skilled Internet players, who has been close to a couple of WPT victories. Erick Lindgren, needs not introduction. Everyone knows who he is and his skills. Both players are quite deep stacked, but Erick has John covered. John folds after thinking a looong time. Lets break down the hand and see what happened. At first the fold seems quite tight. Many bad players has difficulties in folding an overpair on this "quite" innocuous board. - That loose guy Erick is limping again, but now I found pocket T, so now I will punish him.... I raise 4 times the Big Blind. - 5, 7, 4, two hearts on the board. I have overpair, but I really don't like the situation. Erick checks, but I cannot give him any free cards on this board. Ok, I bet almost pot. - Erick went all-in? What a pig! Hmm. I have overpair, and if I just don't think so much, I can find a call. If I fold, I have lost 35% of my stack. I have almost talked myself into a call... No, it isn't possible. - What can he have that I beat? There are really only 2 hands that I'm in a good position against, and that is 88 and 99. If he has a higher pocket pair, he beats me. If he has a lower pocket pair he probably has a set. If he has 66 he has an open end straight draw. - I don't think he has a straight at this moment, then he wouldn't go all-in. Can he have a draw hand? There is really no start hand which he could have called my pre-flop raise with a 6. Longshot that he has A6 suited. Flush draw? It is quite usual to check raise all-in with a flush draw, especially if the opponent isn't pot committed. The problem for me is if he for instance has a KQ in hearts, he doesn't only have a flush draw, but also two overcards. In that case he leads with a 55% chance of winning the pot. - So far in the tournament I have shown good hands when I have raised and bet. Erick has seen that. He knows I have a good hand, but still he chooses to go all-in. - No, I choose to stay in the tournament for a while longer. FOLD. - I will get even with him later. - Pocket 4s. Now I will hit a set as I usually do. I'll just call and hope to see the flop cheap. - That "J-Dags" is raising me. Not only has he imitated my nick, now he tries to run me over. Call! - Yes, set! He surely has an overpair to that board. Now, I only have to figure out how to take his stack. Usually I bet out with a set. If John then has an overpair, he should raise me, and make himself more or less pot committed. - When I think back a few hands in the tournament, I recall an interesting hand with the exact same pre-flop action as this one. 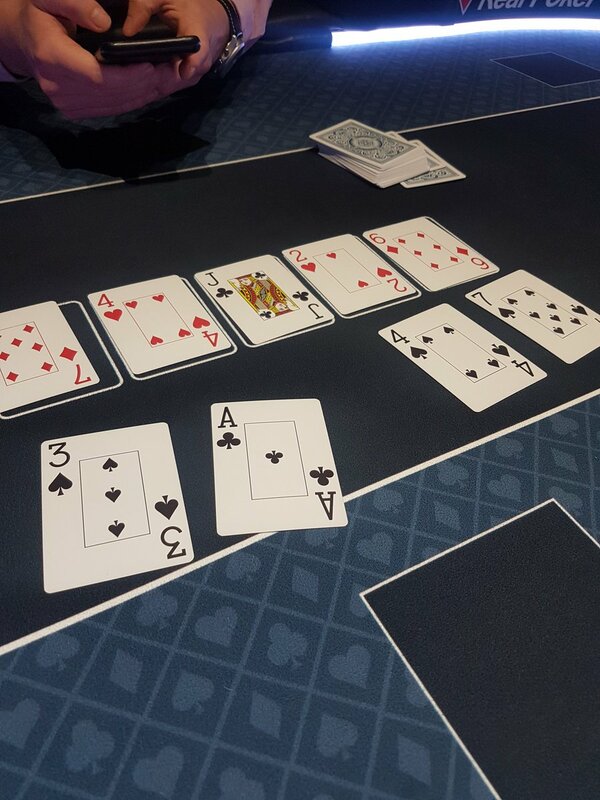 The Grinder limp-called Johns raise pre-flop, and check-raised all-in after the flop. John figured out that the Grinder had a flush draw and called with all his stack on pocket Kings. - Now there are two hearts on the board, and I put John on an overpair. I try to do the exact same thing as the Grinder. I think both players played the hand well. With the result, we know that if Erick could re-play the hand, he had made a bet on the flop, instead of a check-raise, but if you saw the full episode, you understand how he thought.